As I fired up Apex Legends for the first time this afternoon, my mind flashed back to 2016. It was just about three years ago that I saw Overwatch for the first time, and was immediately delighted by the fighting game-like character select screen, expressive heroes, and rapidfire combat. 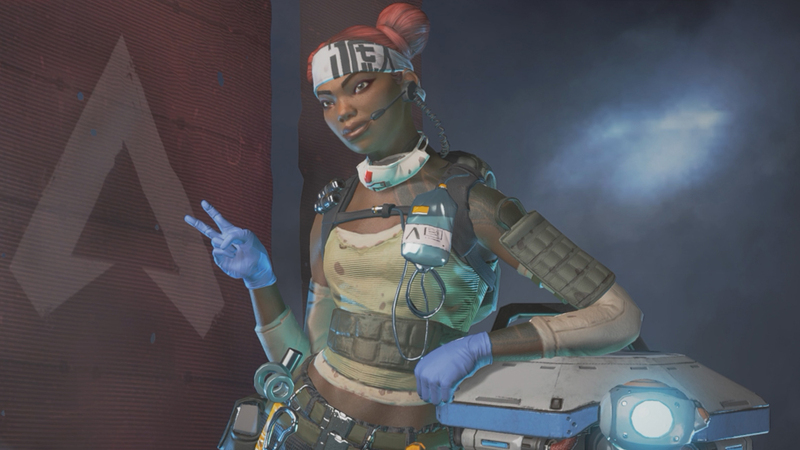 Looking at Apex Legends, which had a surprise launch earlier today, it seems as if Respawn was taking notes. Overwatch's influence is obvious from the moment you hit the character select screen. For one, the heroes all look like off-brand Blizzard characters. Pathfinder looks like Bastion, only with a big smiling face in its chest and a cheerfully snarky attitude. Gibraltar is Reinhardt; Wraith is like Sombra, and so on. It's a far cry from the original Titanfall games, which were more Call of Duty with a sci-fi flavor. But then, even Call of Duty is pretty cartoony these days. Exaggerated art styles are very much in vogue thanks to Fortnite and Overwatch, not the least because they are charming while still running on a variety of systems, and it's hard to blame Apex Legends for going along with the crowd. But Overwatch's influence extends much further than just the graphics style. Unlike Fortnite, PUBG, or a half-dozen battle royale games, Apex Legends is strictly squad-based. You can't play solos or duos. If you're playing on your own, Apex Legends will match you up with two other players and send you on your way. This is because the characters in Apex Legends are clearly intended to synergize with one another. Every single character has a passive ability, an active ability, and yes, an ultimate, and they each fulfill a specific role on a three-person team. Pathfinder offers increased mobility with its Zipline Gun; Lifeline is the medic, and Gibraltar is the tank. When properly utilized, these abilities have the potential to quickly swing a match. Naturally they don't come close to matching the complexity of Overwatch. A team in Overwatch is double the size of one in Apex Legends, and every hero fills a niche in pursuit of a specific objective. Apex Legends is far more generalized, with every character being able to more or less hold their own in a firefight. Still, abilities are crucial to success in Apex Legends. It's quite something to round a corner and find a Lifeline rapidly healing a Gibraltar, both of them under a shield dome. Add in the fact that it's possible to revive a fallen teammate by collecting their data and bringing it to a respawn point, and teamwork becomes mandatory. If you're foolish enough to try striking out on your own, you will quickly find yourself outnumbered. In fact, Apex Legends is so invested in keeping players together that it features a "Jumpmaster" that can guide everyone to the same drop point. This format, plus the relatively small map, makes it hard to avoid opposing squads, and early encounters are pretty much inevitable. In my first dozen or so matches, I found myself in immediate firefights roughly half the time. Unlike, say, PUBG, which is a slow build in which you land, collect goods, and eventually get into a big firefight, Apex Legends is more of a rollercoaster. You'll hit the high of a big firefight; then a lull, then another high, and so on. After a battle is finished, you earn experience, and if you're lucky, a loot box. Overwatch, of course, brought cosmetic loot boxes firmly into the mainstream, and as with everything else, Respawn is keen to follow its example. Being a free-to-play game, Apex Legends is loaded with special skins to start, both for characters and weapons, which are available via "Apex Packs." Nevertheless, there are several key differences. Apex Packs have a pity counter that will guarantee a top-level drop within 30 tries, and many of the skins are available directly through the in-game store on a rotating basis. Apex Legends also locks away two of its eight characters at the outset, cutting its roster down to a mere six heroes to start. Given time, it's possible to earn enough in-game currency to unlock Mirage and Caustic, who are reminiscent of Tracer and Roadhog respectively, but it'll take awhile. Clearly, EA and Respawn are hoping that you'll just knuckle under and buy them immediately. The limited hero selection is probably Apex Legends' biggest weakness right now. With so few heroes available out of the gate, most of the squads are very similar, with Gibraltar being on practically all of them. More heroes will be available in a month or so, but for now, it feels quite limited. But in the meantime, despite its obvious Overwatch influences, Apex Legends manages to be just different enough to stand out from the competition. Its hard to imagine it supplanting, say, Fortnite, but it might have a chance to cut into the popularity of Call of Duty's Blackout mode. Amusingly, Apex Legends may also end up cannibalizing the audience for Battlefield 5's own battle royale mode, which is due next month. Apex Legends ultimately bears only a passing resemblance to Titanfall, and fans are already mourning the loss of familiar features like wall running. But if Respawn's goal is to translate the charm and teamwork of Overwatch to the battle royale genre, then it's passed at least one test. Apex Legends is now available on Xbox One, PC, and PS4. We answer questions about the battle pass, mechs, and everything else in our Apex Legends FAQ. Tagged with Battle Royale,	Electronic Arts,	Opinions,	PC,	PlayStation 4,	Respawn Entertainment,	Shooters,	Xbox One.